Dresden – every day's a holiday! A couple of years ago Jon and I visited Dresden. We loved walking along the river and exploring the museums there. My favorite place was the beautifully restored Frauenkirche where we listened to an organ concert. You’ll have to show me pictures! So dreadful. Till today I don’t understand why this had to be done. Thank you for the video. 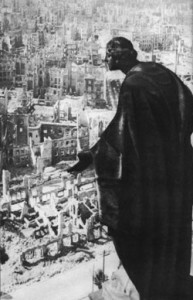 I have never seen pictures of the human losses in Dresden. I pray Israel will not look the same after Iran gets the bomb.